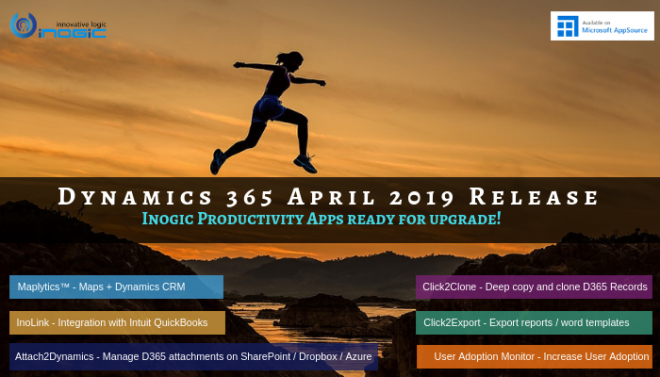 Microsoft Dynamics CRM 365 always surprises us with the new features that are being introduced. One such feature is “Booking Alert” on Schedule board. Booking Alerts in Field services is an activity type which has ability to show in the schedule board. Booking Alert is actually an effective alert for the Dispatcher who is working with the schedule board and work orders. It helps the dispatcher to get an alert on the urgent work that needs to be finished and can schedule the work orders accordingly. Now there are ways to create “Booking Alert”. You can create new Booking Alert directly from the schedule board. Navigate to Field Service -> Schedule Board. Other way to create “Booking Alert” is from the work order. 1) Create work order either from a Case or an Opportunity. For example, navigate to Opportunity -> Create a record -> click on “Convert to Work Order”. 2) Navigate to the generated work order and click Other Activities -> Booking Alert. 3) Following screen opens up where you need to fill in the details of the Booking Alert. Regarding: Work order is prepopulated because we have open the booking alert from the work order. Basically Regarding is set to indicate what record the alert is related to. Assignees: This is set as the user who needs to be logged in to see the above alert. In our scenario, these would be the dispatchers those people who works in office and not on field. Dispatchers have access to the work orders and schedule board. Due Date: This is a Date/Time field which should be the future date. Due date is the date/time this Alert will be popped up in the schedule board. Once you save the Booking Alert record, Activity record would appear against the “Regarding” that has been set on the booking alert as shown in below screen. Also if you navigate to “Statuses” which is available in the related entities of the Booking Alert record. You would see the below record created. The same booking alert would appear on the Schedule board as well shown in below screen. Note: Booking Alert to appear on the schedule board might some time. Once user clicks on “Dismiss”, the alert will be disappeared and status of the “Booking Alert Status” record would be inactive. 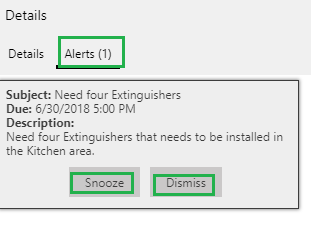 Snooze will allow user to set alert later. For example, the alert time snoozed to 30 minutes, then the “Next Time to Show” on the Booking Alert Status updates to the snooze time. In the above example, the “Next Time to Show” = 6/30/2018 5.00 PM on Booking Alert Statuses record. User snoozed the alert for 30 minutes. So now the “Next Time to Show” would be updated to “6/30/2018 5.30 PM”. Also the Alert disappears from the schedule board. If you double click on the “Alert” shown on schedule board, then it will open the Booking alert record. From Booking Alert record, you will get the work order as we had set work order in the above example, then Dispatcher will go and schedule this work order. Booking Alert is the only activity that could be shown on the Schedule board. It helps the dispatcher to get an alert on the urgent work that needs to be finished and can schedule the work orders accordingly.